Kansas City, MO, September 06, 2018 --(PR.com)-- Kansas City Breweries Company, LLC ("Kansas City Breweries Company" or the "Company") has finalized the acquisition for all alcoholic beverage (beers, wines & spirits) rights to the nationally registered trademark LOUD AND PROUD® from the mark’s creator, Norm Johnson (former NFL field goal kicker for the Seattle Seahawks) of 12 Brands LLC. The familiar mark has been adopted by sports fans at amateur and professional athletic events around the world. The mark is especially strong in both Seattle Washington and Kansas City where sports venues engage in an intense rivalry over which city has earned the LOUD AND PROUD® honors. LOUD AND PROUD® is heavily used by posters in Social media and Twitter to associate themselves with their support for baseball, football, and soccer teams and players. The Twitter hashtag phrase LOUD AND PROUD is documented in over 1.3 million public conversations in the last month alone and #LOUDANDPROUD has been used in over 135,000 posts on Instagram. Kansas City Breweries Company adopted the strategy of being strongly associated with field sports, hunting, fishing and motorsports from its sponsorship of popular radio broadcasts and racing teams showing consumers its products are the familiar style of crisp domestic lager beers they grew up with and not craft beers. Kansas City Breweries Company has heavily supported the fans of local Baseball, Football, Soccer Teams, Sprint Car Racing, NASCAR Camping World Truck Series, and Truck & Tractor Pulling since the brewery’s 2012 revival. With the acquisition of all alcoholic beverage rights to the registered trademark LOUD AND PROUD®, Kansas City Breweries Company will utilize its increased visibility to collegiate and professional field sports fans and market its LOUD AND PROUD® beverages with its KC LiteTM, KC LagerTM, and KC MaltTM sports beers. To make the ownership readily available to the Company’s beer customers and investors, Kansas City Breweries Company shares are offered at twenty five cents per share through GrowthFountain.com, a registered funding portal with the US Securities and Exchange Commission (“SEC”) and a member of the Financial Industry Regulatory Authority (“FINRA”). 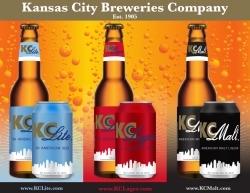 Kansas City Breweries Company LLC has developed and test marketed the KC LiteTM, KC LagerTM, and KC MaltTMbeer brands as the successor to Kansas City Breweries Company to begin large scale beverage manufacturing of alcohol & non-alcoholic beverages. Kansas City Breweries Company LLC is concentrating on creating high growth value propositions for beverage, grocery and convenience store markets. Kansas City Breweries Company LLC’s founding President and CEO Ms. Terri Bricker, is committed to producing the KC LiteTM, KC LagerTM, and KC MaltTM Loud and ProudTM value brands and tapping into customer demand by being lower priced than the competition, while offering the regional affinity and identity of craft beers, but with the familiar tastes of crisp domestic beers customers made a staple in family gatherings, weekend sports events, and evening relaxation. 12 Brands LLC is organized by NFL field goal kicker Norm Johnson to manage intellectual property rights in the apperal and beverage markets. This press release may contain forward-looking statements and information relating to, among other things, the company, its business plan and strategy, and its industry. These forward-looking statements are based on the beliefs of, assumptions made by, and information currently available to, the company's management. When used in the offering materials, the words "estimate," "project," "believe," "anticipate," "intend," "expect" and similar expressions are intended to identify forward-looking statements. These statements reflect management's current views with respect to future events and are subject to risks and uncertainties that could cause the company's actual results to differ materially from those contained in the forward-looking statements. Investors are cautioned not to place undue reliance on these statements, which speak only as of the date on which they are made. The company does not undertake any obligation to revise or update these statements to reflect events or circumstances after such date or to reflect the occurrence of unanticipated events. Source: Kansas City Breweries Company, LLC.